Fellow packet herders. I have set myself a challenge lab encompassing some stuff I have learned. I feel it’s time to challenge myself in the public arena and post the results. I am aiming to find some time this week to hit this out. I am looking to be a little busy with wedding preparations but I do have some down time nights that I am going to attempt to lab this out. 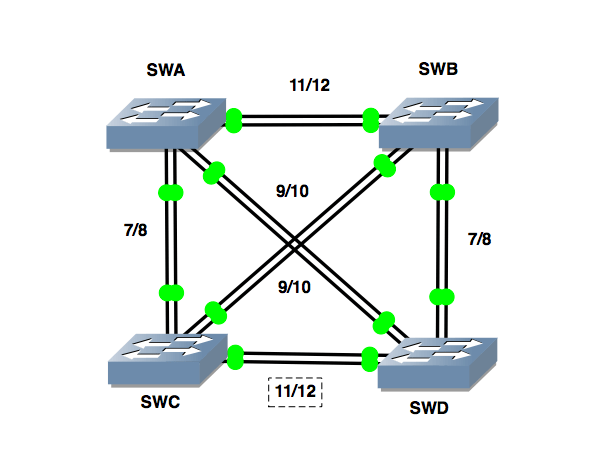 SW-A and SW-B are Cisco 3560-x and SW-C and SW-D are 2960S. All four are 48 ports. Just adjust the requirements of interface ranges to match your hardware. Configure Gi0/7-8 and Gi0/11-12 on each switch using a IEEE trunking standard. Gi0/9-10 on all switches should use ISL. DTP frames must not be sent. Distribution switches must handle negotiation of these interfaces. Create a VTP password and ensure version 2 is used. Assign IP address to each device from the Management VLAN. Now that base connectivity has been established in out network it is time to implement some security and keep those pesky people out. A lobby PC will be connected to Gi0/1 an Gi0/3. Enable the ability to learn the MAC Address dynamically and err disable the port if a different device is detected. Gi0/16-20 on SW-C/SW-D require up to 5 different devices to be learned before violating. This network requires a strong level of uptime and the time has come to implement some HA technologies. SW-A and SW-B will be supporting each other in a HA setup. Virtual IP addresses are to be 10.0.x.1/24 of each VLAN. Follow good design principals when implementing HA – Think how L2 STP is placed. If SW-A is active, SW-B should be standby. Visa Versa. Ensure that if a switch goes down and comes back up that it regains it’s active status.